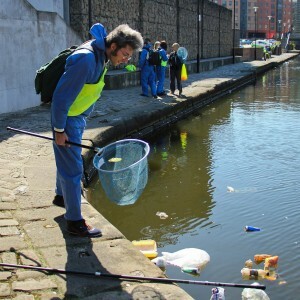 Rough Fish is a pervasive trash fishing, story telling game in which players compete to fish rubbish out of the Rochdale canal in Manchester city centre, gaining points for fishing rare objects and making up stories about them. Rough Fish is a pervasive trash fishing, story telling game in which players compete to fish rubbish out of the Rochdale canal in Manchester city centre, gaining points for fishing rare objects and making up stories about them. Over a weekend in April 2015 over 100 participated fishing or spotting rubbish and scoring points using the Rough Fish mobile game app. The game was invented by international artists TRES, whose practice explores how we relate to rubbish and uses a range of creative tactics to reconnect people with the materials that we disregard. Their research looks at the political and material implications of waste as residue of contemporary civilization. Fishing for rubbish and taking an anthropological approach to sorting and documenting it is a key part of TRES’s practice. Neil worked with AND festival producer Ruth Mcullogh to support TRES to create a mobile game to distribute their trash fishing practice, so that larger groups of people can get involved. This involved hours of paper prototyping and user centred design, to refine the game mechanics and communicate this to the app designers. Running a large scale pervasive game along miles of canal tow paths in a busy city is no small feat. In addition to the technical challenge of developing the game app, much of the production effort went into working with the Canal Rivers Trust to ensure that the game was framed in a way that was safe and accessible as well as fun and thought provoking. Rough Fish was the artists’ first work to be made in the UK and culminating in a collective conceptual mapping event, where Fishers will traced their trash, mapping relations through a social, economic, political or environmental lens. At the event the winner of Rough Fish was awarded the honour of having a Manchester canal lock named after them. To see more about the project, see the AND Festival website and the projects Flickr photoset.